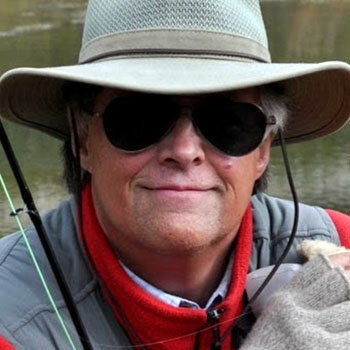 There are few names in the world of fly fishing so widely known and solidly established as Skip Morris. Skip has published twelve fly-fishing books, including the genuine best-seller (currently in its 22nd printing) Fly Tying Made Clear and Simple. He has also authored many other books including: Fly Tying made Clear and Simple II, Advanced Techniques, The Art of Tying the Nymph, The Art of Tying the Dry Fly, The Art of Tying the Bass Fly, Tying Foam Flies, Concise Handbook of Fly Tying, The Custom Graphite Fly Rod, Morris & Chan on Fly Fishing Trout Lakes (with Brian Chan), Waterproof Fly Fisher's Guide: Western River Hatches, Morris on Tying Flies, and Trout Flies for Rivers. Skip Morris shares his secrets of finding and catching big largemouth bass as well as tips on tying bass bugs and flies. Fly Rod & Reel, Fly Tyer, Fly Fishing and Tying Journal, Warmwater Fly Fishing, Fly Tying, American Angler, Salmon Trout Steelheader, Western Outdoors, Fly Fisherman, Fly Fusion, Midwest Fly Fishing, Hatches and Just Jazz Guitar. The fall 1996 issue of Fly Tying magazine contained a feature article about Skip titled "Skip Morris, the Man in the Painting." Skip's original fly patterns are tied and distributed by the Solitude Fly Company of Alhambra, California. Their current catalog contains around 30 of Skip's patterns, many in several sizes. "The Fly Shop" in California—one of the major fly-fishing mail-order houses—carries several of Skip's patterns in its catalog and on its website. He is the instructor on six videos and has worked in radio and television as both a fly-fishing host and celebrity guest. He lives with his wife, Carol, amid the rivers and lakes and saltwater beaches of Washington State's wild and magnificent Olympic Peninsula.